Finisterre is a small company hailing from Cornwall in the UK, who are especially well known in surfing circles. While I sadly don't surf (another unfulfilled dream of my youth) Finisterre appeared two years ago on my radar, and I have written about their Bise MkII Vest previously. I've also been a long time user of their Zephyr Boxer Shorts and can't imagine a better boxer shorts for my outdoor and everyday needs. 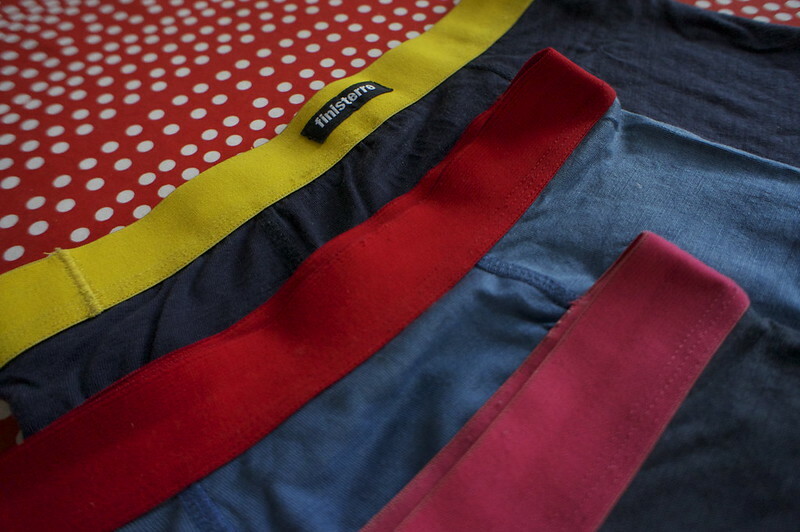 The fabric is 100% Merino and it is Made in Portugal. The weight for my size S shorts vary from 76 over 82 to 84 gram. 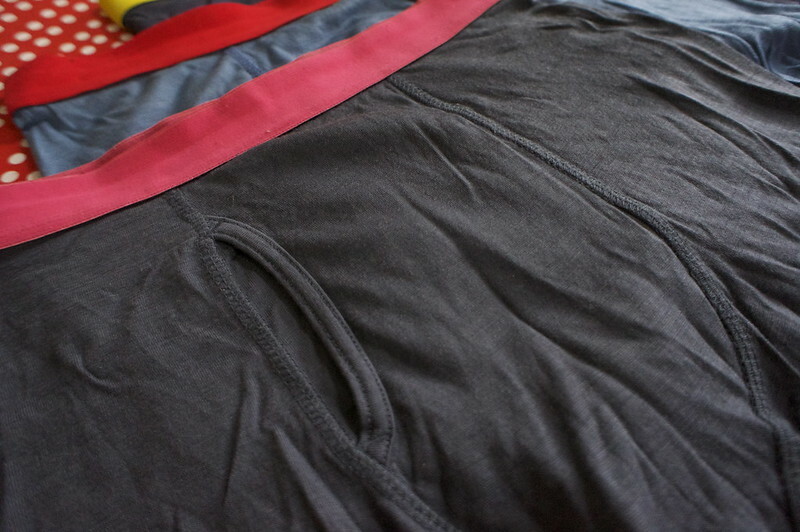 They have a nice wide elastic band which keeps them comfortably up and not let them slip down. Sometimes the elastic band turns (lays double) but that probably comes more from my inability to dress correctly. The Superman coloured one (thus blue fabric, red band - it's the one in the middle) is nearly two years old and has held up very well - there was a small hole in the crotch, fixed already, but nothing serious. They pile a tiny bit as you can see from the photos, but all in all a lot less than my boxers from other natural materials. Chafing is something I have never experienced in any boxers or pants, so I can't report on that front. They're tight but I don't find them too tight or restrictive. The flat seams on the inside aren't bothering me neither. When they get wet from perspiration, and as I do sweat a lot they do get wet, they're still comfortable. However, they dry quickly even if not standing around a fire with your pants down to warm your buttocks, given that you had a good warm meal and have dressed well. On the smellyness scale they do beat any boxer shorts I have used before. Where bamboo or synthetic boxer shorts would start to reek after a day or two of backpacking/ skiing/ climbing, these merino boxers have been worn for up to nine days without ill effects (proper personal hygiene was maintained at all times). Spring, summer, autumn, winter, they're always comfortable. In Finland, Russia, Germany, the Netherlands and Sweden. Do I need to mention that they're coming in beautiful colour combinations? You can buy one Zephyr Boxer Shorts for £24 or a set of two for £50 (Mathematics doesn't seem to be the strongest subject of someone at Finisterre) directly at Finisterre from their online shop. Their service is great and when I ordered mine they were within a week in Finland. And their return policy is ace as well. Though I doubt you want to return such good boxer shorts like these. This year it's £10 off anything you like and will be available for 2 weeks. Use promotional code ATHANKYOU to get your discount (online orders only). That's one boxershort for £14!